The art gene runs true and strong in my husband's family. Allan's father and his father's father were recognized talents in the field, as is Allan and his brother. That particular stream runs a bit more shallow in my family - only my mom and brother Steve can claim to have the artist's touch. That is until I was forced encouraged by my peers to find my inner Martha Stewart. There's a bunch of girls at PUMP who are naturals at all things sponge painting, stamping, scrapbooking, and Michael's craft store. The first several years we were together for Mom's Group or a women's evening out, I would stare in misery at whatever craft project lay before us. The choices of patterns and colors and where to place the ribbon was always enough to send me into a cold sweat. I really don't enjoy the feeling of complete incompetence. 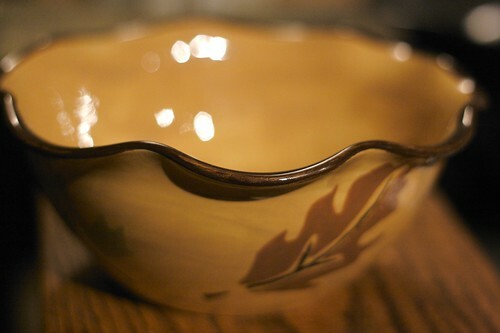 Fast forward to today...This crafty mama convert elaborately designs and creates cards and books, sketches in charcoal and pencil, paints ceramics (see photo - the bowl I brought home today), and can bravely and boldly (okay - maybe it's still timidly) declare myself "artist". So I raise my ceramic painted mug to my friends for encouraging me to stretch into a new and unknown world. So, some of your Mom's talent is beginning to come out in you? That's great! There is no doubt that it didn't come from my side of the family. I have always been frustrated that I don't have the creativity of a dead stick. I admire people who can take some colors and put them on an object such as a canvas or a cup, carves a piece of wood, or chisels a stone in a way that inspires us, and even leads us to an appreciation of God and the things he created. Since God is the beginning of all creation, to create is to be a bit like God. You are an artist. You are created in Gods image. Being an artist is something you have always had in you. From the way you look at building, put a picture on a wall. You have always been an artist you just didn't see it.By the way it beautiful. Ok, you got me. You did a mug? I thought because of the pic you didi that bowl! It is very well done, by the way. Good for you for getting out there and giving it your best. I make things that look like Jacob did them in a hurry! The photography I see on your blog is art in itself. It doesn't suprise me that other things you do are so classy and stylish. Kristi you are good at creating. I have seen plenty of your projects and they are awsome.